To enable the Power-Up, open the board menu on the right side of the page, select the Power-Ups menu option, and then click the "enable" button next to the Evernote Power-Up. 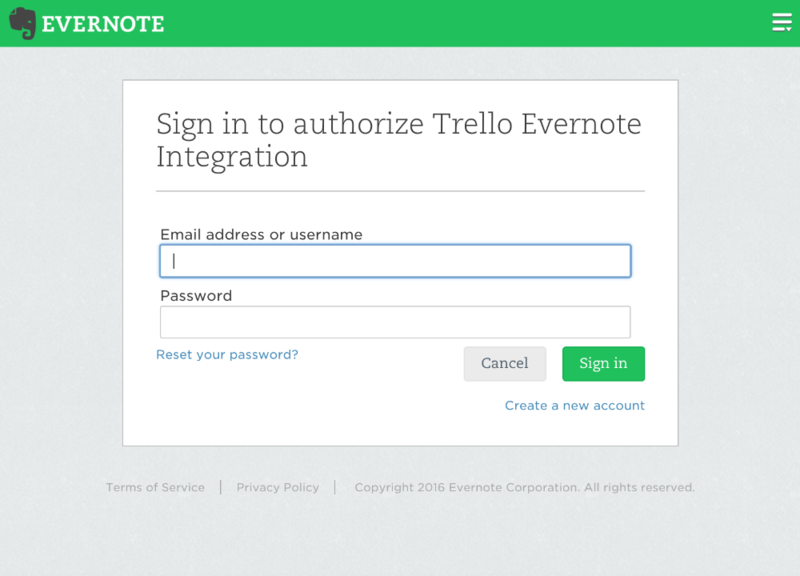 Once the Power-Up is enabled for the board, each individual user will need to authenticate their Evernote account from within Trello. To do that, open up a card, click on the Evernote button in the Power-Ups section on the back of the board, and select "Link with your Evernote account"
A pop up window will open, requiring you to log in with your Evernote credentials and authorize Trello to access your Evernote account. The Power-Up can be accessed from the back of the card by clicking the Evernote button in the Power-Up section. 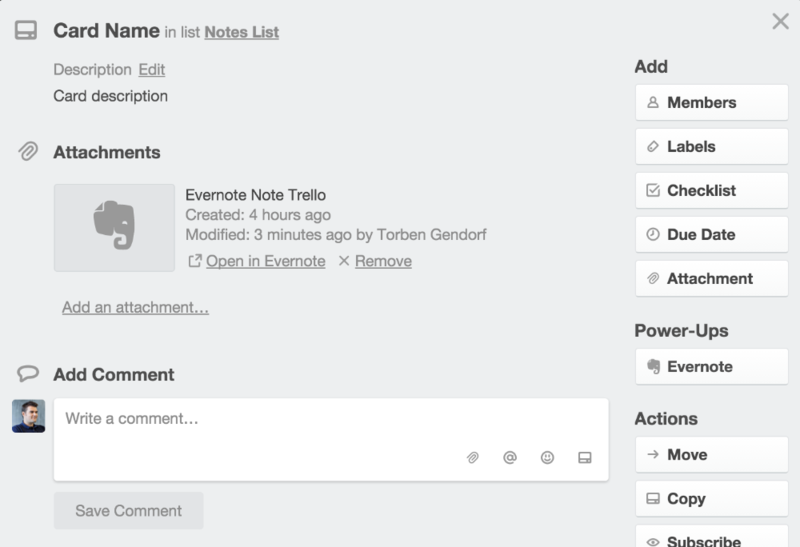 From there, select whether you want to create a new note to attach or attach an existing Evernote note to a card. Please note that only notebooks that you "own" can be linked to Trello. That includes notebooks which you share with others but does not include notebooks that have been shared with you but are owned by another user. To create a new note, click "Create and attach note" and fill in the title and select the notebook, that you wish to put the note in and hit "Create and attach". 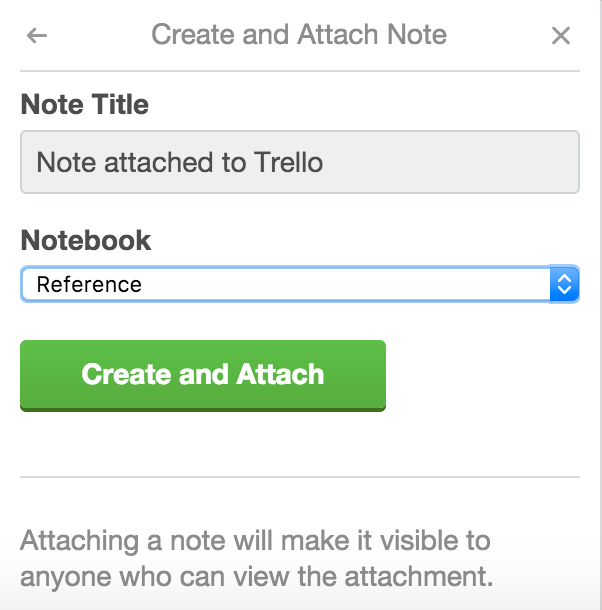 Alternatively, you can attach an existing note to a Trello card by selecting "Attach note". 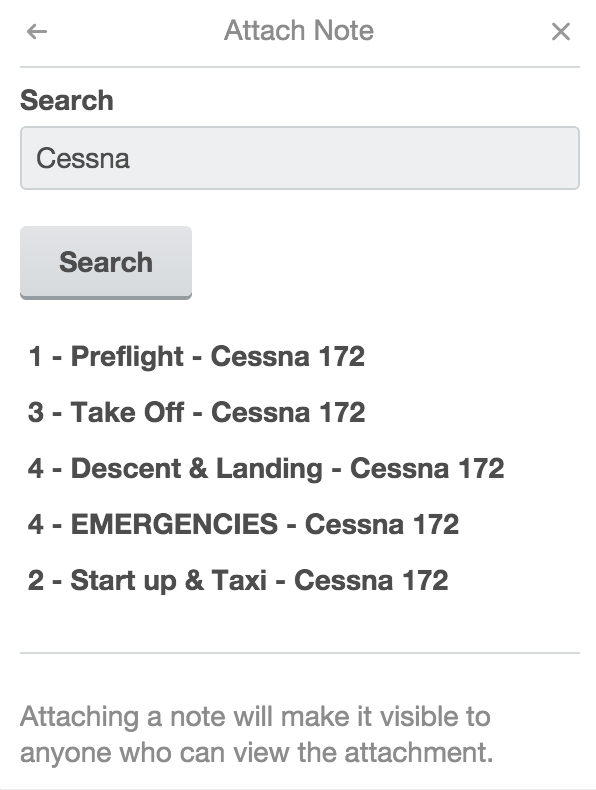 Select the note from the suggestions or search for the note title. Once the note is attached to the card, it will show in the "Attachments" section of the card. Please note that it will be visible for anyone that can access the card and view the attachment. To remove a note from the back of a card, click the "remove" link displayed next to the note. 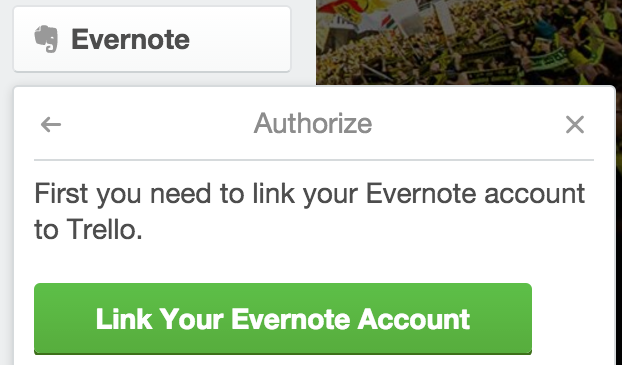 To disable the authorization with your Evernote account, open the board menu and select "Power-Ups". Click the gear icon next to the Evernote Power-Up, and click "Remove Personal settings." To disable the Power-Up for this board, click "Disable" next to the Evernote Power-Up. Disabling the Power-Up will not cause any data loss. It will change the formatting of the links in the card to be the same as any other attached links.